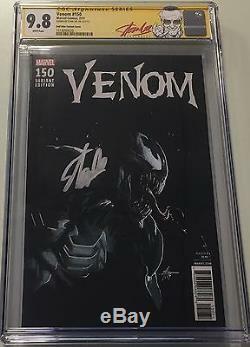 This is a "Venom #150" Autographed Comic Book. This comic book is CGC Graded/Certified a Signature Series 9.8 with White Pages. Variant Pedigree: "1:25 Dell Otto Retailer Incentive Cover". Comes with the Exclusive "Red" Stan Lee CGC Signature Series Label. We have several of these so Signature look and placement will vary slightly on each book. We will do our absolute best to describe every item accurately. However certain items such as ungraded/raw comic books are subjective. That being said no grade by 3rd party graders like CGC is stated or implied. The condition listed in our description is simply our opinion of the listed comic book based on our experience. The item "Marvel Venom #150 Signed by Stan Lee CGC 9.8 SS 125 Dell Otto Variant Red Label" is in sale since Monday, June 26, 2017. This item is in the category "Collectibles\Comics\Modern Age (1992-Now)\Superhero\Spider-Man". The seller is "excelsior_collectibles" and is located in Brea, California. This item can be shipped worldwide.